A 100th anniversary celebration to be held at the Baron Lake camp this summer is being planned by the people who have continuously offered youth and family camps, retreats and other gatherings here for the past century. 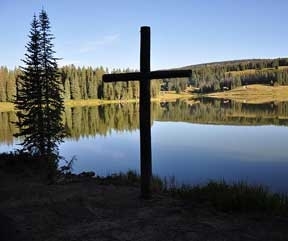 Grand Mesa Christian Association invites former campers and those interested in the future of the camp to mark their calendars for Saturday, July 8 and prioritize being part of the festivities. Bev Chambers of Rifle says, “I was raised in Cedaredge and first went to camp – where my sisters had gone – in the 1940s as a high schooler. I met people from all over – loved it, returned as a counselor while attending what was then Mesa Junior College, and have stayed involved through my church ever since. Information is available on the camp websites: www.grandmesabaptistcamp.org or www.grandmesacamp.com. For additional details, to RSVP or to provide names and contact information for invitations, contact Betty Schanz in Grand Junction, 970-250-5102 or bkschanz329@msn.com, or Connie Pittenger in Montrose, 970-249-4308 or conpittenger@gmail.com.